Numerous tools and tips have been posted on this blog to create bootable disk drivers and here we have yet another simple utility to get the job done easily on Windows. 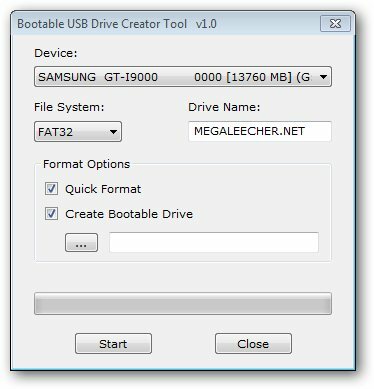 "Bootable USB Drive Creator Tool" does what it says by allowing users to create their USB disk-drives bootable using the straight-forward, minimalistic, self-explanatory user-interface. The utility is standalone and does not require an installation, to make any removable disk-drive bootable simply launch "Bootable USB Drive Creator Tool" and select your removable drive, now browse for boot-files by pointing the file-browser to "USB Drive Boot Files" folder from the archive. any more nice software giveaways ? Thanks for the great software.. Can you send me the instructions how to do it.. Always depending on you guys. You are the best!!! when i try to use the app I get an error message saying bad volume/name what does this mean ?